Owner Seth Biersner sits proudly in his waiting room. 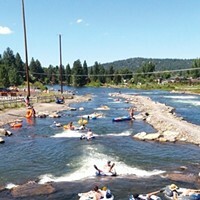 Floaters can add their experiences to the float journal. Photos by Angela Moore. Weightlessness used to be reserved for space travel, but that is no longer the case. Float Central in Bend is under new management by an enthusiastic and absurdly charismatic floater named Seth Biersner, age 40, occupation unknown—he's still trying to figure that out. What has been decided, however, are his intentions when it comes to educating the public on the importance of floating and self-reflection. Biersner is not only the owner, he is also an avid floater himself, crediting his better night's sleep and positive emotional shifts to the unmatched power of floating. "I believe that floating is a powerful way to reset your nervous system as your body gets a chance to fully surrender and rest, meditate, stretch and sleep," says Biersner. For those who are a bit lost as to what "floating" is, let's clear that up now. Essentially, a person enters an enclosed tomb-like box that is devoid of sound or light. The water is mixed with enough salt to allow a person to be submerged in water while still being able to float. The temperature is meant to match a person's body temperature, allowing for the maximum nothingness sensation. To break it all down: The body is suspended in water with no outside stimulus, allowing the person to be not only completely weightless, but also to have no outside distractions. The only thing that can be heard is breathing and any water shifting during movement. Let's address the elephant drowning in the room: It can seem scary to some. Biersner makes it a point to inform those who may be put off by the physicality of the experience, to assure that the person is in total and complete control the whole time. 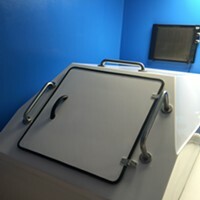 There is an optional light that can be used inside the tank, the door does not need to be closed, and the water isn't filled to the top. "I want people not to be shy about voicing their concerns," says Biersner. He aims for the experience to be, first and foremost, a comfortable situation. After all, it is meant to allow the mind and body to relax in a way that is rarely achievable by any other method. Once that is achieved, Biersner says that the physical sensation of floating comes from when body, water and air equalize. "You are conscious, but you feel absolutely nothing," he says. Floating can create intense dreams and a full spectrum of emotions, he says. He goes on to describe that although he can recall the intense emotions or feelings of bliss, he cannot recall what actually took place during the float. From the first experience, floating can be wonderful and powerful, but practice only makes things better. Floating helps to bring together mind, body and soul, and much like meditating, it takes time to get comfortable enough with oneself, the experience and the surroundings.